My husband Bob and I are delighted to have you in our e-congregation! As I’m writing this, Bob and I are putting the finishing touches on the first Sunrise Church foray to the internationally famous Edinburgh Festival Fringe. Wow. What an undertaking! We’re presenting a 50-minute evangelical extravaganza. It’s got sing-a-long sermons, heartfelt prayers, our bookclub… and bangin’ Christian rock songs that will have you moving and grooving to God’s word! Bob and I have meaningful lessons to share with you about Jesus, judgment, Christian rock and personal grooming, so sit down, stand up, pass the cash bucket and join on in! *That's officially the Church of Universal New Testament Sunrise - not to be confused with any other Sunrise Church, none of whom have anything to do with us. Which is a shame, really. Women love one another. Their sisterhood is strong. They lead a Rainbow Life. Full of colour. Full of beauty. To share the love of God, his Kingdom and the bright colours of his Patriarchal Reign, the Sunrise Church invites you to join Fanny Comfort and a host of inspirational speakers from around the world at the Sunrise Women's Conference, Rainbow Life 2008. Love God, Love Women, Love Life at Rainbow Life. 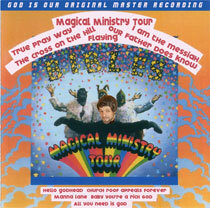 Check out Bob's latest platinum selling album, "Magical Ministry Tour". To get this and more music, click here. Copyright © 2007 Wisepart Jews & Communists, All rights reserved.